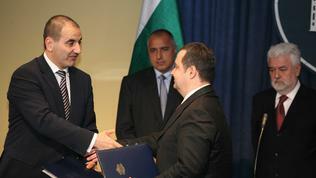 The fact that the Bulgarian Prime Minister has graduated from the High Special School of the Ministry of the Interior as an engineer in fire precaution technique and safety and a lieutenant in the same time, probably all children in Bulgaria's kindergartens know well, because he used to open new kindergartens quite often before he started the construction of highways. The fact that the President of Serbia Boris Tadich is a psychologist and even taught at a high school in Belgrade, I learned quite recently, listening to his speech before the Serbian Parliament, regarding the future actions of the country in the Kosovo case. Although I know most of the stakeholders in Serbia's political life in the past several years, this detail has eluded me until couple of weeks ago and appeared quite conveniently right before Tadich's visit in Varna on August 6. A visit of which media are not quite certain what to expect of, aside from the fact that a firefighter and a psychologist would meet in the residence Evxinograd, near Varna (Bulgaria), and that among the issues that are to be discussed, according to the official information, would be tightening of the traditionally good bilateral relations. And as statements for the press are planned only at the arrival of Mr Tadich at the Varna airport and not after their meeting, I can only give you several speculations about the talks between Tadich and Borisov. I can bet they will again talk about the Sofia-Nish highway, about Serbia's participation in the construction of Bulgaria's second nuclear power plant Belene and, of course, about the good neighbourly relations, and how important peace in the Balkans is. Regarding the highway we already know what the Bulgarian Prime Minister has ordered: we are starting to build at accelerated rates in order to complete the part to Kalotina (at the Bulgarian-Serbian border) faster than the Serbs and in the same time in a way that it would go round the current border crossing, because by the time the highway is built, Serbia will already be a member of the European Union, thus making the crossing unnecessary. Serbia's wish to take part in the construction of Belene has also been confirmed several days ago by the Bulgarian Minister of the Economy Traycho Traykov. In the same time, however, no one really knows what will happen to the project itself, so there is nothing we could promise to our neighbours. The issue of peace in the Balkans, which will probably be included in the official press release after the summit in the form of several sentences, requires much more efforts and time and depends not only on these two countries. I suppose that the work of the Intergovernmental Agreement for the construction and operation of a joint contact centre for police and customs cooperation will also be discussed. The Bulgarian deputy Prime Minister and Minister of the Interior Tsvetan Tsvetanov and his Serbian counterpart Ivitsa Dachich have signed the agreement in Belgrade in the end of April. If we get back to the issues, discussed during the April visit of Boyko Borissov in Belgrade, there is no way that both sides would miss the issue of ethnic Bulgarians in Serbia this time too. But, on the other hand, Minister Bozhidar Dimitrov, who is responsible about Bulgaria's policy towards Bulgarian communities abroad, is now busy with more important things like the preservation of the relics of St. Joan the Baptist. According to my observations neither Borissov, nor Tadich will miss to boast the accelerated construction works, going on in their countries. The Bulgarian Prime Minister, of course, will explain how quickly we will build the Trakiya highway and the Serbian President may explain here too, that "no one in Europe is building so many bridges with such a quality as Serbia" (the Serbian head of state said this on Thursday after visiting such a construction site). But, like I said, the fact that the summit is organised in Varna and not in Sofia, and that journalists will only get a press release after it's over, automatically reduces our chances to understand whether Borissov and Tadich have managed to tighten the relations between Serbia and Bulgaria.